A two component primer/tack coat designed to bond new cement based products to existing concrete surfaces. 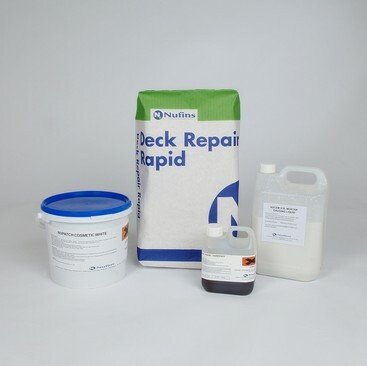 Initially developed for use with the Nucem range of cementitious repair compounds, the primer is characterised by its excellent adhesion to both concrete and steel reinforcement. The formulation is based on a water dispersible epoxy resin containing cement which provides an alkaline environment to protect steel reinforcement from chloride and carbon dioxide attack. Excellent bond strength to concrete and steel. Suitable for both wet and dry substrates. Provides added protection to steel reinforcement. To download the Nucem Primer Technical Data Sheet click here. To download the Nucem Primer Technical Safety Sheet click here.